Harper’s almost right. Baseball is in desperate need of a cup of strong coffee. It needs personalities and brands and excitement more than ever. The thing is, by Harper’s definition, baseball’s always been tired. You’ve never been able to express yourself. So, Harper isn’t just hollering for a relaxing of new rules; he’s talking full-scale rebellion. Count me in as one of his minutemen. To its credit, baseball is trying to keep up with the 21st century. No league – not even the ultra-hip NBA – has better social media accounts than the MLB. Their @MLB Twitter, Instagram and Facebook accounts get videos up the quickest, their Snapchat is the most interactive, and MLB At Bat is miles ahead of the next best sports app. But most of the time, it seems as if the league’s official accounts are the only ones discussing baseball at all. Twitter’s Basketball subculture is alive and well nearly every night of the regular season, not to mention the playoffs. On Sundays, all Twitter is is a sports bar where everyone knows the Cover 2. Even worse, baseball never extends itself out of its own realm. Basketball, meanwhile, constantly collides with the Instagram fashion world. Vines of Cam Newton’s dabbing created the dance move of 2016. All do respect to Mr. Gossage, but here is the problem. Baseball players like him are afraid of standing out because all the players indoctrinated into the same culture. As a result, their Twitter feeds are boring, their postgame quotes are vanilla, and you wouldn’t be able to recognize them if they walked right by. It’s always been that way. 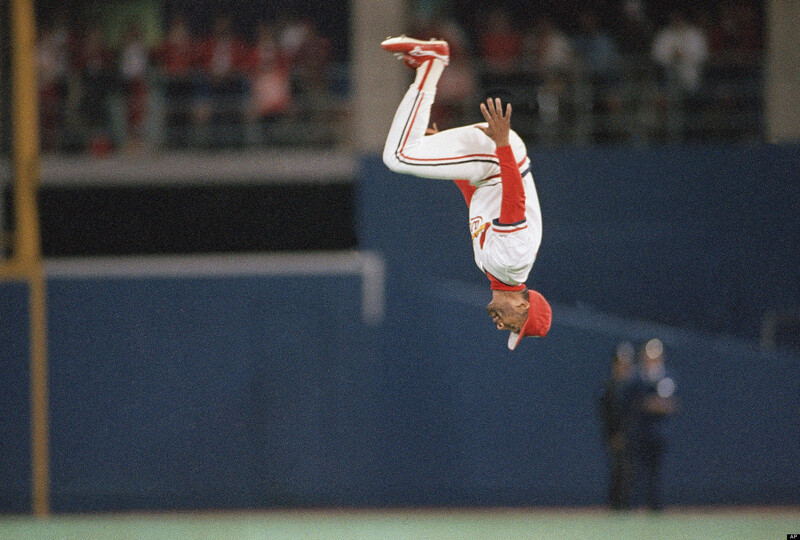 Ozzie Smith had to be persuaded into doing his famous backflip, because, he says, he didn’t want to be labeled “a hot dog”. After Ron Santo started clicking his heels after Cubs wins, sportswriters called him arrogant, and he became the frequent target of beanballs from opposing pitchers. Both are Hall of Famers, but both are now most beloved and remembered for their signature antics. So, if baseball has always been this way, why change now? In short, it has no other choice. It must evolve if it’s going to survive. Its average fan is 53, and 18 to 34 year-olds are 14 percent less likely than the overall population to show interest in the sport. Baseball is a sport built for radio, just as football is made for TV and basketball for the Internet. Hockey’s medium of choice, on the other hand, is in-person. Hockey was only able to stay relevant until the advent of the Internet, when its forum became three-removed from the modern standard. I don’t know what will come after the Internet, – VR? – but that day might be baseball’s reckoning. What the sport can do to combat irrelevance is to reach out, specifically to win over young fans. There’s no better selling point than personality – just ask Steph Curry and JJ Watt. Baseball certainly doesn’t have a talent problem, with young guys like Mike Trout, Kris Bryant, Manny Machado, Mookie Betts, Carlos Correa and Harper (I could go on) getting better each year. But baseball does have a personality problem; Harper seems to be the only one of the group who isn’t afraid to speak his mind or sport a signature hairdo. So let players flip their bats after home runs. Let pitchers pump their fists after a strike out. Let guys backflip and heel click all they want. Let them speak their minds, and make sure that whenever a team goes to New York for a series against the Mets or Yankees, a star player finds a seat on Stephen Colbert or Jimmy Fallon. Make sure celebrity is part of a star ballplayer’s job description in the 21st century. Mike Trout is unbelievably talented – and boring. The fact of the matter is that the collision of baseball and celebrity wouldn’t have to pollute the sport, just like it didn’t corrupt the NBA or NFL. Baseball, more than any other sport, relies on tradition, so players like Gossage would fight the change. Dabbing after a double play wouldn’t jeopardize what Tinkers-and-Evers-and-Chance helped build, though. What players wear, what they say, and how they celebrate doesn’t change the importance of results – Steph Curry can gloat all he wants, but Lance Stephenson cannot. There would still be balls and strikes, only people would actually be watching them. And how to welcome traditionalist players to a modern game? Simple. Wanna bean that guy for trash talking a little bit? You’ll be suspended the next game! I’m writing this because I love baseball. I want my future kid to stand in the backyard and imitate all his favorite ballplayers’ batting stances just like I did. I don’t want to have to drag him to the diamond to games that feel like Civil War reenactments. I want to share guys like Harper with the rest of the world. And I want to make baseball fun. For the first time. Joe, I enjoyed reading this blog post even though I don’t agree with it. I suppose beauty is in the eyes of the beholder, but something is horribly wrong with a person who dares to call a no-hitter, “dull”! Sure, I would have enjoyed watching my Astros pound out sixteen runs as they did a few days ago, but I would much rather see a low score, or no score pitcher’s duel anytime. For me, that is the unmatched thrill in baseball. Mike Scott’s no-hitter that clinched a play off spot for the Astros? Who could dare call that dull? You called for baseball to move into the 21st century? Well, you got a taste of it yesterday. No concussions or brain injuries (I don’t think), but the Rangers got in a right hook that I have never seen in baseball before. Odor stunk up the place but probably sold a lot of tickets at the same time. Please subscribe me to your blog and tell your mom I said hello! Thanks for the note, Molly. I’m not saying no hitters are dull – there are very few things in sports as exciting as a perfect game. I’m calling for more expression and spontaneity in baseball. The fight yesterday was caused because the Rangers were ticked off that Jose Bautista had the audacity to celebrate his home run in the playoffs last year. And there is certainly a case to be made that that fight was overwhelmingly a positive for Major League Baseball. It mad the sport, the day after a game seven in the NBA playoffs, the lead story on sports radio and Sportscenter. Friends of mine that hadn’t talked or thought about baseball in years couldn’t help but reenact the play at school this morning. Obviously, that’s not what you want every day in baseball…but is it the worst thing in the world?